The Dire Wolf (Canis dirus) is one of the most well-known predators of Pleistocene North America and recently made famous by the television series Game of Thrones (although the animals depicted in the series are much larger than their real-life counterparts). These were mid-sized predators closely related to the modern Coyote (C. latrans) and Gray Wolf (C. lupus), both of which coexisted with it during the Pleistocene. on display at the Perot Museum, Texas. Wiki. The genus name Canis is the Greek word for “dog”. The species name dirus is derived from the Latin word dira, which means “ominous”, “fearful”, or “dreadful”. Dire Wolves were geographically widespread throughout North and South America during the Pleistocene, reported from 136 localities in North America and 3 localities in South America. Whether or not this species originated in North or South America is a matter of much debate. Its range extended from Alberta, Canada to Tarija, Bolivia north-to-south. Its habitat included forested mountains to open grasslands and plains up to 2255m (7400ft). Compared to Pleistocene Gray Wolves, Dire Wolves appears to have favored somewhat wetter environments and their fossils are often found in association with ancient marshes, rivers, and lakes. Most famously, the highly productive site of Rancho La Brea, California has yielded the remains of over 4,000 individual Dire Wolves, which had become mired in the asphalt trap most likely after attempting to hunt or scavenge other animals that died there. These wolves are frequently found at the same localities as the Saber-toothed Cat (Smilodon fatalis). Dire Wolves were comparable to Gray Wolves in terms of linear measurements. However, the Dire Wolf was physically more robust and heavily built than the Gray and could have weighed as much as 20% more than a comparably sized Gray Wolf. The skull in particular is proportionally larger and broader with a more prominent sagittal crest*. The canines and carnassials* are also larger. Measurements of the skull suggest that Dire Wolves had a bite force that was about 20% greater than that of the Gray Wolf. Dire Wolves also had sturdier limbs with shortened metapodials and a longer tail. Although undoubtedly a swift runner, Dire Wolves were not built to pursue fast-moving herbivores over great distances the way that Gray Wolves do. Instead, they may have relied more on ambushing prey, taking turns chasing it, or even by chasing animals into the water where its movements are hindered, all of which are tactics still employed by modern pack-hunting canids. 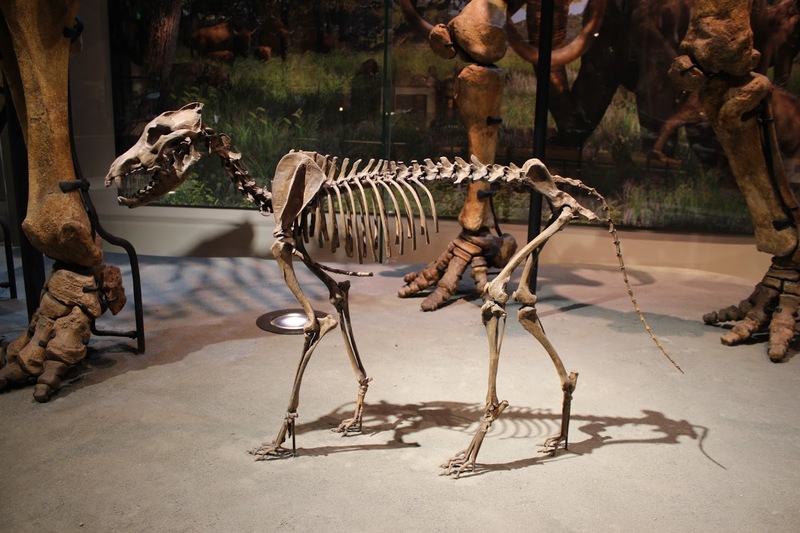 Because of their greater biting capacity, Dire Wolves have often been suspected of being bone-cracking specialists similar to modern hyenas of the genus Hyaena and extinct “hyena-dogs” of the genus Borophagus. 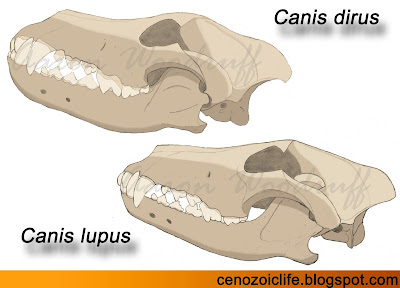 However, studies of their overall dentition and bite damage of fossil bones have demonstrated that their teeth were no better at breaking bones than its modern relative the Gray Wolf, although it must be noted that these wolves can (and do) damage and ingest considerable amounts of bone during feeding. Furthermore, the crushing aspect of the Dire Wolf dentition is not any more developed than that of its modern relative while the slicing aspect is enhanced. Thus, it may be inferred that the robust skull, stronger bite, and larger teeth of the Dire Wolf, coupled with its sturdier frame, was more of an adaptation for seizing and pulling down and rapidly consuming larger herbivores rather than an adaptation for bone cracking. 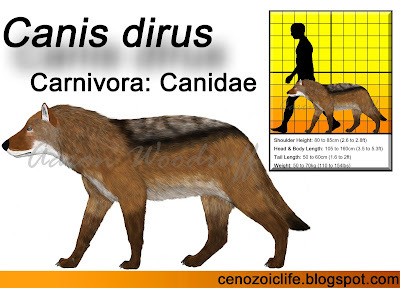 In this way, the hunting and feeding style of the Dire Wolf was likely more akin to that of modern canids like Dholes (Cuon alpinus) or Bush Dogs (Speothos venaticus) which frequently and efficiently hunt prey that is considerably larger than themselves. This, in turn, hints at the potential niche stratification between the Dire Wolf and the Gray Wolf during the Pleistocene. Gray Wolves were more commonly found in drier and more well-drained environments and can exist at higher altitudes than what the Dire Wolf appears to have tolerated. Pleistocene Gray Wolves would probably have focused more on ungulates weighing 50 to 300kg (110 to 660lbs) as its primary prey base. Modern Gray Wolves struggle to bring down ungulates weighing more than 500kg (1,102lbs), even in winter when such animals are easier to overwhelm, with hunts often lasting hours and with a high incidence of injury. Dire Wolves, on the other hand, were potentially hunting prey as much as 10 times their own weight, with a prey menu that included horses, tapir, large deer, camels, and bison, although they would also have opportunistically hunted smaller animals in their environment such as capybaras, giant beavers, and peccaries as encountered. Given that larger prey animals were a more prominent element of the Dire Wolf diet, it is also likely that these animals occurred in relatively larger packs numbering as many as 20 individuals, as opposed to modern Gray Wolves whose packs average 10 members in most areas. on display at the Page Museum, California. Wiki.